Justice prevails in the form of Superwoman as she unleashes her inner goddess and does her best to draw us away from Superman and Batman’s insipid presence, says Sukanya Verma. A year ago, when director Zack Snyder got Batman and Superman together on celluloid, the so-called cinematic event turned into a mighty snooze fest, a mindless exercise in franchise worship and a biting embarrassment for DC Comics’ biggest icons. A year later, Snyder remains a glutton for excess, stuffing the frames with CGI-whipped eruptions and enforced gloom. Except Justice League, which reunites the superhero duo along with a bunch of spunky new members and makes more room for Wonder Woman to flex her unbelievably toned muscles (and with legitimate reason), benefits from intermittent moments of freshness and fun. Though a definite improvement on Dawn Of Justice, the sequel appears too pleased on getting some of the essentials right to display any more ambition. Having said that, the post-end credits scene hints at a long-term planning in franchise narrative and its beliefs of slowly showing its cards. Things move forth at a vigorous note around a completely stale scenario -- a new evil by the name of Steppenwolf has emerged and, aided by his army of airborne Parademons, gained possession of three power-packed mother boxes safeguarded by Amazon, Atlantis and Earth respectively. To save the world (read a family of four) from their wrath, moneybags Bruce Wayne (Ben Affleck) and his faithful aide Alfred (a crackling Jeremy Irons) assemble a counter attack team starring Diana Prince (Gal Gadot) still sighing over that blue-eyed pilot from her solo movie, Arthur Curry aka Aquaman (Jason Momoa), a burly surfer dude sporting dip-dyed locks and a tattooed torso, Barry Allen’s The Flash (Ezra Miller) too busy being starstruck around superhero elite to gloat about his lightening fast speed even as Victor Stone, now Cyborg (Ray Fisher), makes peace with his fractured face and fantastic powers. Throw in a newly resurrected man in the red cape (Henry Cavill) and this Justice League concert is ready to hit the road. Their introduction and interaction, banter and bravado fill Justice League’s predictable proceedings and serviceable action pieces with a playfulness that’s uncharacteristic of its brand but most welcome. What’s not is how there’s no urgency around the antagonist, no heft in his pursuit or magnitude around the apocalyptic crisis. Justice prevails in the form of Gadot as she unleashes her inner goddess and does her best to draw us away from Cavill and Affleck’s insipid presence. Fisher makes most of his defined backstory, Momoa is pure swagger but it’s Ezra Miller’s goofy charm and spontaneous humour in a Spidey-Stark reminiscent equation with Batman that evokes the maximum laughs. 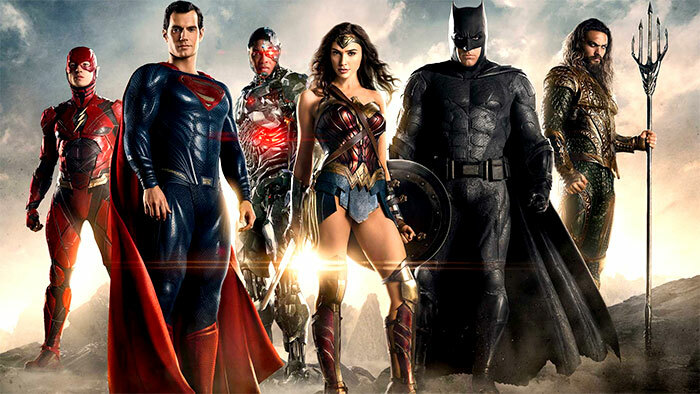 They are the only reason why nearly three hours of Justice League's blobby structure, sullen palette and superfluous battles are all right to endure. I wasn’t bedazzled. I wasn’t bored.